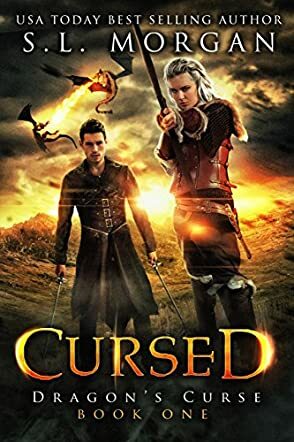 Cursed (Dragon's Curse, Book One) by S.L. Morgan is a deftly written epic fantasy with impeccable world building that will delight fans of Christopher Paolini’s Inheritance Cycle. Prince Alexander of Pemdas summons himself into the future of his kingdom and his world is swiftly falling apart. The Queen is undergoing a slow death, slowly consumed by her magic while her allies are turning away from her. He has to rely on his gift to save his world from collapse, but will it be enough? Carrier of dragon blood and last descendant of her kind, Kira, daughter of the last true Rajakiem, is distraught as her world spirals towards the brink of destruction. When Alexander comes into her world, the two do not start off well, but quickly realize that to defeat the darkness threatening their worlds, they must work together and must tread a treacherous path while facing formidable enemies. There is a way to defeat the encroaching darkness and wielders of dark magic, but the path is fraught with danger. This first book works so well for an opening entry into a fantasy. S.L. Morgan creates a melting pot in the setting of this narrative, melding different dimensions, universes, and galaxies into the tale. The story has powerful underpinnings of mythology, with creatures like dragons, pegasuses, witches, and others becoming part of the narrative. There are elements of time travel in this magical tale, and each of these elements is handled sparingly, without allowing any one of them to impede the excellent pace. The story starts with Alexander and in a compelling first person voice, and raises serious questions about the destiny of his kingdom, then moves swiftly to the awkward encounter between the two key characters of the story. I was gripped by this author’s crisp prose and by the way the dialogue is built. Cursed (Dragon's Curse, Book One) has everything readers want in epic fantasies — a magical setting, complex plot lines, and sophisticated characters.